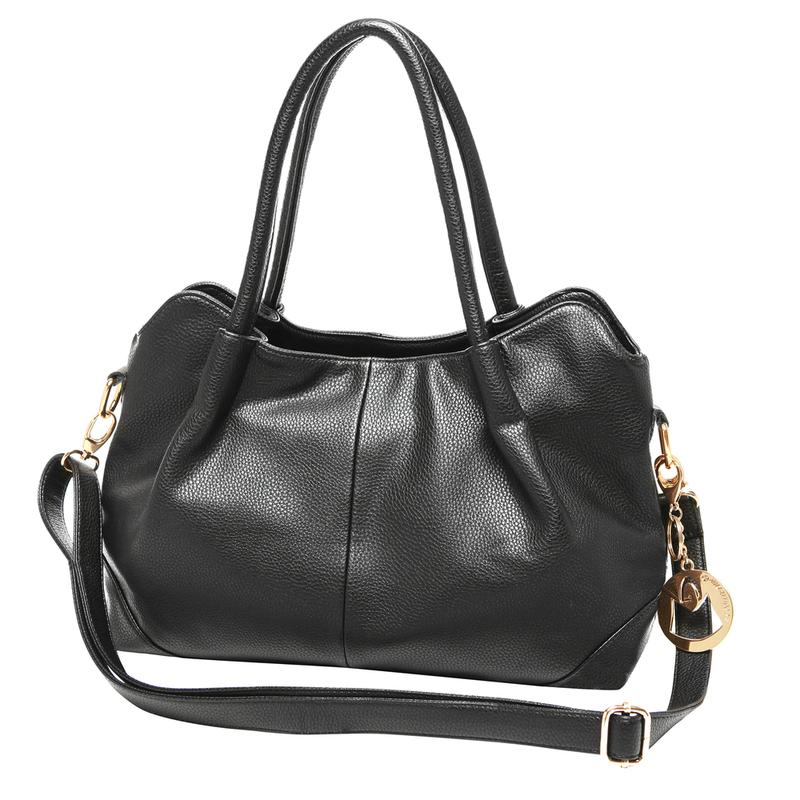 A timeless style featuring classic black leatherette, gleaming gold-tone hardware, and an on-trend hobo bag shape. Interior includes fabric lining, 2 slip pockets, and 1 zippered pocket and a zippered pocket on the back exterior. The 2 sturdy top handles and the 1 adjustable and detachable shoulder strap give you multiple carrying options. Approximate Dimensions: Exterior - 15" W X 10" H X 6" D; Interior - 15" W X 7" H X 6" D; Handles - 7" handle drop; Shoulder Strap (fully extended) - 25" shoulder drop. This fashion satchel’s always-stylish black leatherette and glamorous gold-tone hardware will keep you looking good at your morning meeting, your after-work drinks with friends, and even your quick run to the grocery store, while this top handle bag’s spacious interior with fabric lining, 2 slip pockets, and 1 zippered pocket will keep your belongings organized and close at hand throughout your busy day. Stash extra items in the zippered pocket on this shoulder bag’s back exterior, and take advantage of the 2 sturdy top handles and the 1 adjustable and removable shoulder strap to keep this women’s handbag by your side and keep yourself looking good and feeling prepared throughout the day or night.